- Manager -- has access to all calls and recordings within the framework of his widgets. - Editor - can edit his widgets and has access to all his calls and recordings (like Manager). - Admin - admin has access to everything except billing. - Owner - has all permissions. Widgets - to serve calls generated by CallPage user needs to be assign to widget. Here you can all widgets he is assigned to. You can find users assigned to specific widget using the filter. In this tab you can always see how many users you has already have and how many you can still add. The number of available users depends on Plan you have (https://www.callpage.io/pricing). Please, note that there is a difference between consultants and sub-accounts with access (sub-account are those with e-mail addresses). Consultants can answer the phone only, they cannot log in. 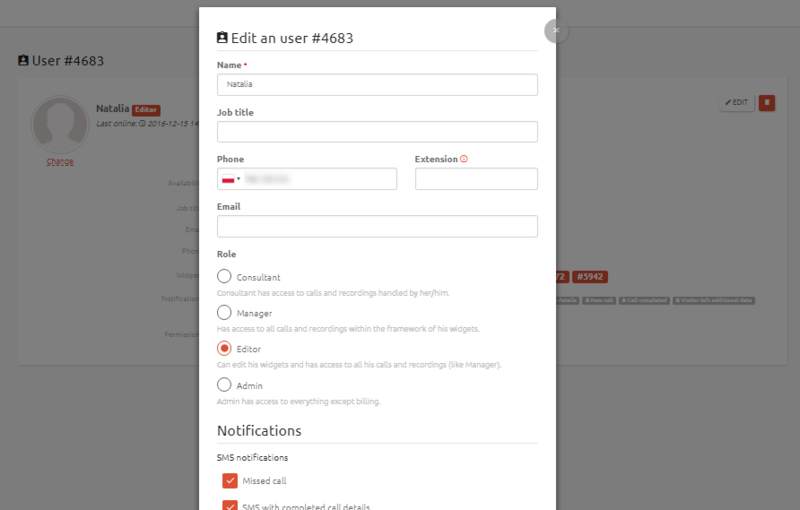 In My team tab you can also add new user - just click red button +ADD USER and the new window will display. You will have the possibility to enter name, phone, e-mail (the invitation will be send on this email. The email will be used for signing in) and user's role. Afterwards you can edit each user easily - just click on the pencil icon and the new window with user's data will display. For more options click EDIT - here you have the possibility to change such details as name, phone, e-mail. You can also add job title and extension number. The extension attribute tells CallPage to play DTMF tones when the call is answered. This is useful when dialing a phone number and an extension. CallPage will dial the number and when the automated system picks up, send the DTMF tones to connect to the extension. Each "w" character tells CallPage to wait 0,5 seconds instead of playing a digit. In editing panel you can also decide which notifications particular user will receive. Please remember to click SUBMIT to save changes.